As regular readers of the blog may already know, I’m starting a kettle corn business and have begun my search for a quality popper. 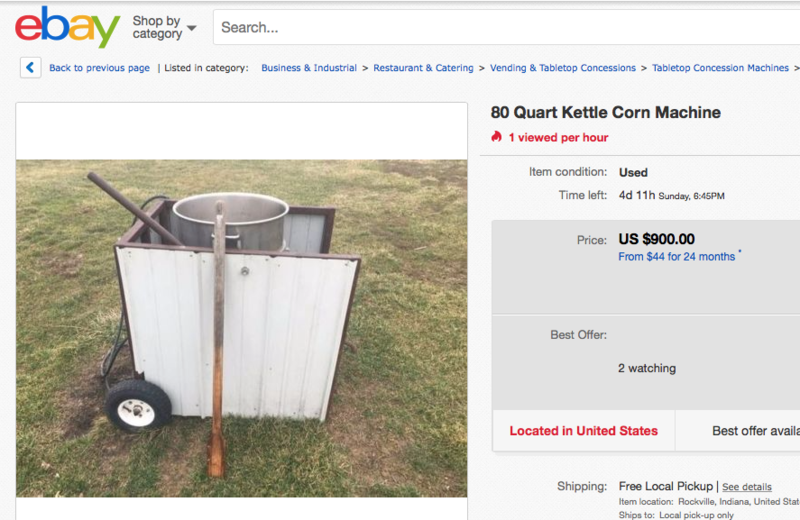 I don’t plan to purchase a used kettle corn machine for my own business, but I do want to understand the cost and availability for this type of equipment online. Who knows, I might even stumble upon a really cheap popper that’s in good condition and reduce my overall startup costs. I’ll dive deeper into the reasons I’m slightly better than 95% sure I’ll be purchasing all new equipment later in the post. Until then here’s a list of places I’ve been able to locate used kettle corn machines online in case you’re looking to do the same in the future. It’s probably no surprise that you can find both new and used kettle corn poppers at eBay.com. There are some poppers you will want to stay away from though if you plan to start a kettle corn business. This example probably won’t be around by the time you read this, but as I conduct my search there is a used 80-quart popper for sale for $900 located in Rockville, Indiana. According to the seller this piece of equipment has been in operate for 3-years at a Pumpkin Patch, but the owners want to upgrade their equipment. From what I can tell this was a homemade popper. The screen shot from eBay is below. This homemade popper is available on eBay for a limited time for $900. There are a couple reasons I would not invest in this popper for my business. First, health code standpoint, I’m not confident that I could pass an inspection with this piece of equipment where I live in the state of California. California has some of the most restrictive health codes in the nation and I personally would not want to risk paying $900 and not being confident I could legally vend. Additionally, I’m not sure this seller could pass his local health inspection in Indiana if needed. According to the equipment details the popper was only being used at one annual event per year. This pumpkin patch / corn maze probably wasn’t audited by an inspector. I’m planning to go out with much more frequency and to events where people will be auditing the cleanliness of my equipment. Second, I’m planning to sell my popcorn at places like wineries and farmers markets in the area. The area I live in Southern California is within 15 minutes of 40 wineries. These wineries are big weekend destinations that I plan to serve. Wineries are a slightly higher end venue and I wouldn’t feel comfortable showing up with this type of a machine at those events. I’m going for a “higher end” look and feel for my brand. Bottom line, I will not be investing in this machine. 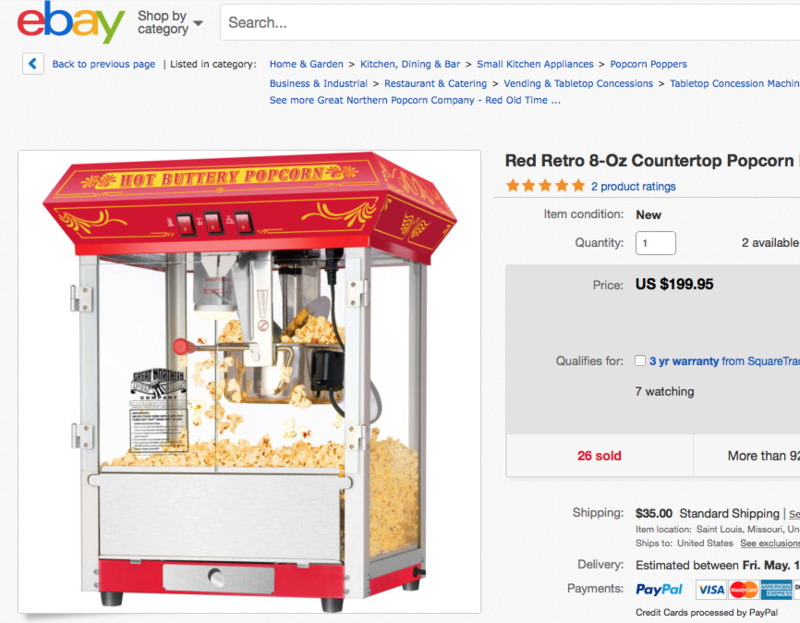 When you start your search on eBay you’ll notice that there are a variety of novelty and retro style popcorn machines for between $150 – $300. I have provided a screen shot of an example below from eBay, but you can find similar products at Amazon.com. Here’s the thing, if you want to have a cool-looking popcorn machine to put on your countertop or a man-cave at home this can be a great option, but it’s not designed for business use. You could get by for a while if you wanted to sell traditional popcorn as part of a concession stand this way, but that’s about it. Novelty popcorn machine intended for home use. Also making high quality kettle corn is all about the process. You need a really hot kettle to be able to get sugar to caramelize and this isn’t possible with this equipment. These popcorn machines simply weren’t designed for this purpose. Also kettle corn is open made from a larger type of popcorn that allows it to expand further. At the end of the day these machines were built for fun to enjoy fresh popped popcorn in your home and with friends. Craigslist can be hit or miss, but if you’re willing to put in some time searching you can find some good deals here. Ideally, you’ll be able to find a kettle that’s located within driving distance so you can view it in person. The best place I’ve find used kettle corn machines on Craigslist is the For Sale > Business/ Commercial by Owner area within your city. If you happen to live near Weatherford, Texas, here’s a great looking new popper being sold for under $2,000. This looks like a great find at a reasonable price and also like the 10-inch tires that have been installed on this 80 quart machine. 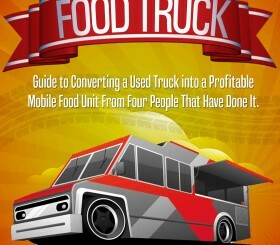 I could see this being much easier to move around, which you will be doing a lot of as a vendor. 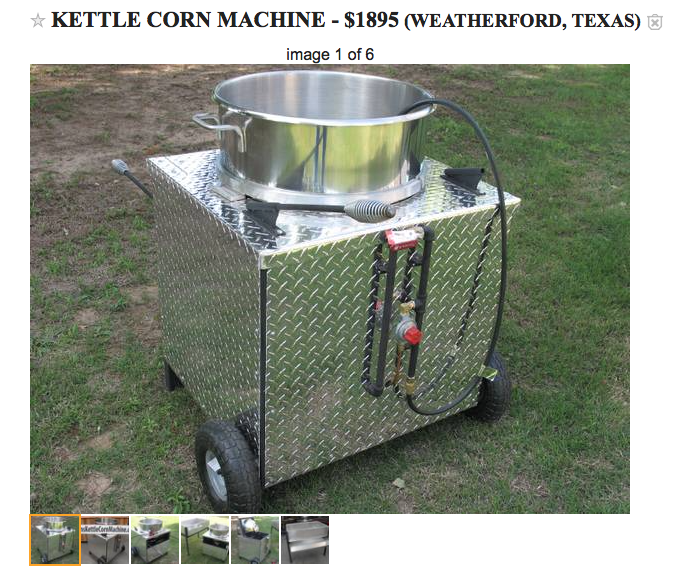 Kettle Corn machine for sale on Craigslist. During my search, I’ve found that current vendors in my area can also be a great resource to find sifters, poppers, sinks, or even trailers. I’ll be publishing a podcast that details a recorded discussion of a vendor in my area that has been operating his business for almost 20 years. This entrepreneur had multiple poppers, three sinks, tents, and other used equipment that he offered up for purchase. The problem with his offer is that I’ve found that I could buy his new equipment for less online than I purchase his used equipment. One example is that this vendor offered to sell me a 3-compartment sink that had hot and cold water options for $1,500. This type of sink is a requirement to operate in Riverside County although in many areas of the United States you will not need this to sell popcorn at events. Before selling me the sink, he would also pull it out of his garage and give it a good scrub down so it would be clean. At first, I thought this would be a good opportunity until I did some searches for new equipment online. Here’s an example of a brand new 3-compartment sink with an additional sink for hand-washing that has hot and cold water options. This brand new sink only costs $999.00 and can be shipped to my home for $235.00. The moral of the story here is to make sure you shop around before taking the first offer that comes along. Sometimes new doesn’t mean more expensive. If you’re planning to start a kettle corn business and need a popper, don’t hesitate to reach out to some of the current vendors in your area to ask if they have any used equipment they would like to sell. You might just stumble across a deal. Most of these vendors can be found on Facebook or through Google searches. While you’re speaking with these vendors anyway, it’s also the perfect time to ask them business related questions or the best places to sell in your area. I am a bit biased with used equipment and I wanted to share that here. My philosophy on buying used is that unless it’s a really good deal (meaning I will pay under 50% what I could buy it brand new) then I probably don’t want it. In my experience, people that want to sell something remember how much they paid for a piece of equipment 5-years ago and want to try to sell it for 75% of what the original purchase price. When it comes to buying pre-owned vending equipment I don’t want to buy something that is potentially worn out, has no warranty, might not pass a health inspection, or isn’t exactly what I need. Many times you end up spending hours of your time trying to save a couple hundred bucks. This is my personal perspective and you need to make the right choice for your situation. But for me, I only buy used if I’m getting a significant discount over what I could buy it new and the equipment must be in good working condition.